So, here’s my before and after shot (the after picture is the one on the bottom if you’re not sure :P). As you can see, I’m a portable girl. I LOVE being in a portable. The only down side is space and lack of storage. And gnats. And mold. And rainy days. But I do love it! I like my own space and my own air controls as I freeze very easily. Here’s my front door teacher sign. This can be found on the front of my portable. 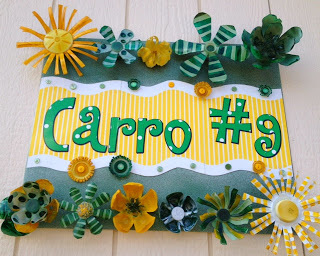 To see more of my recycled door signs, click here. Here’s our computer space. The seats are plastic planters I found at Walmart. 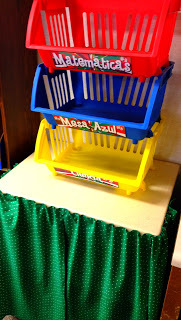 They’re great and stackable, which helps with space. 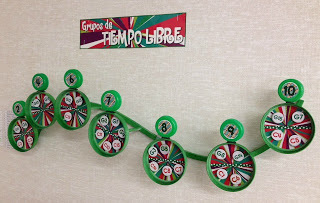 Here’s my free time choice sticks display. 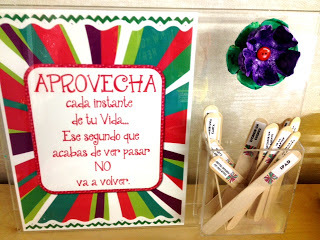 I have several free posters about saving time in English and Spanish that you can find here. Here’s our post office. 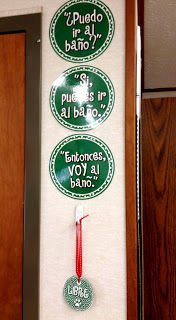 There’s just two rules: 1) Only write in Spanish and 2) Be nice! 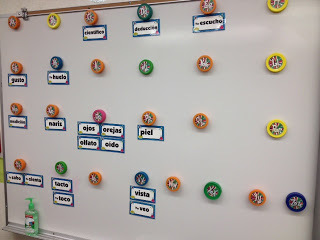 Here’s our “Pared de Palabras.” The alphabet labels are made from juice caps and other lids. You can see how I did it and download free alphabet stickers here. 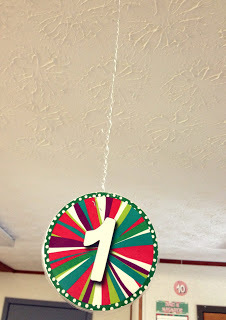 I do LOTS of small groups, so I made these hanging numbers to landmark each station/center. The string is actually recycled plastic soda bottle strips! You can see how I did that here. 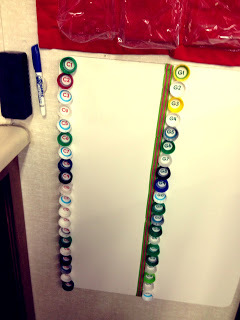 Here’s my objective board with more bottle cap labels. 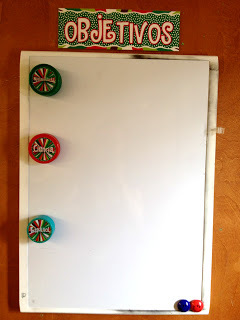 Here’s an upcycled two-sided frame that I will use to display awesome student work. 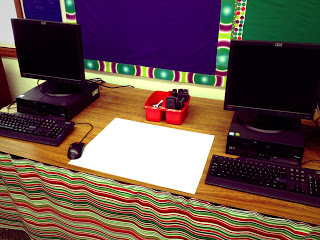 This little corner I created for students to record their time when they quiz each other with out bottle cap math facts. You can see how that works and get your own free labels here. 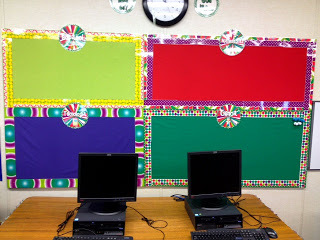 Here are my bulletin boards. The background is fabric and the borders I created and printed myself. 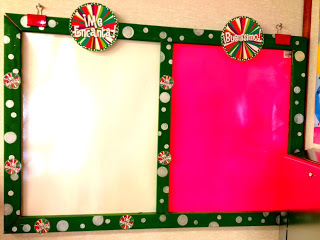 To see my Bulletin Board Bundle, click here. Here’s are related arts schedule. Once again, I’ll try to get this ready for my Spanish friends, if interested. 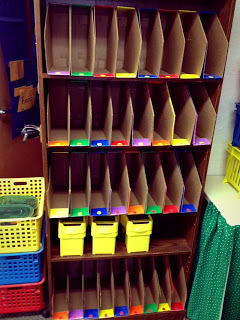 This is our storage for games during group time. Trying to make the most of every space! 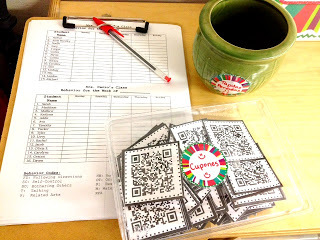 Here are QR code coupons that students earn for good behavior. You can download your free copy here. 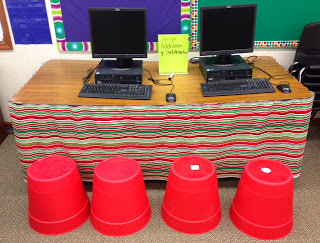 Here is our Flapbook station. This is my first time to try it this way, and I think I’m going to like it. 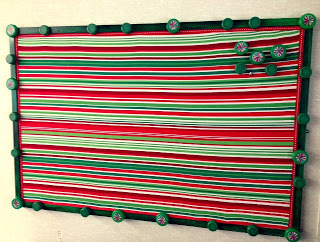 Here’s a bulletin board that got a makeover. You can see how I did it here. 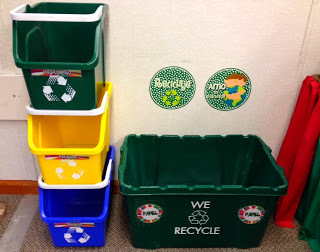 Our recycling center! Kids are the best recyclers! 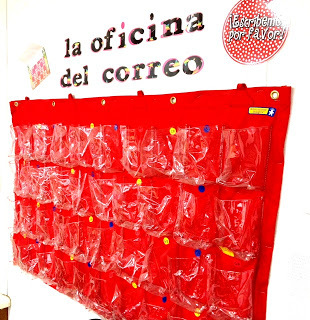 You can download some free Spanish and English recycling posters here. 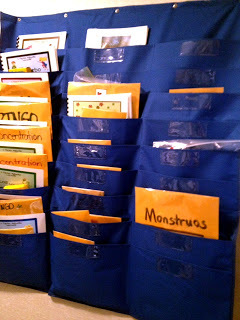 I found these organizers at Amazon y ME ENCANTAN!! I got my husband to line the walls of my closet with these to help store my millions of center games. 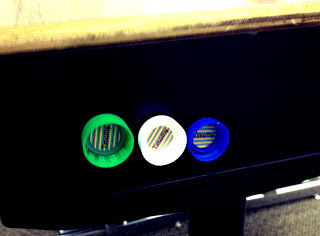 Bottle Cap Behavior System – You can read more about that here. My First Upcycled Cookie Sheet! We are using this for science grouping. You can see how I did it here. This is basically our cubby system. Flapbooks and work notebooks are stored here. 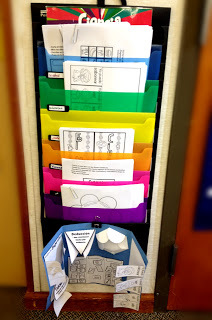 Free Time Grouping Display – I made this from a candle holder. It’s super easy to change and every day, when students finish their work, they have an automatic center to go to. So far it has completely removed that, “What do I do now?” or “I don’t want to do any of those options.” Check it out here. Mr. 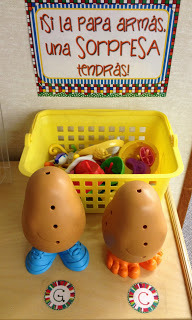 Potato Head Behavior Management System! 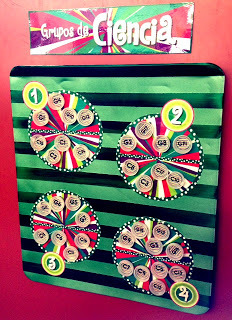 Great for rewarding the whole class for good behavior. Get a free poster and see more details here. 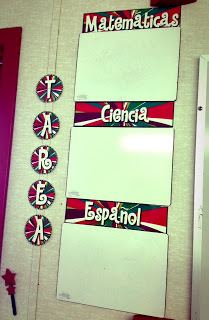 I found some dry-erase vinyl at Hobby Lobby and it’s so cool. When students play Smart Board games, they can work out problems right there instead of trying to use the marker feature on Smart Board. Have a super fantastic year!! Everything looks great! 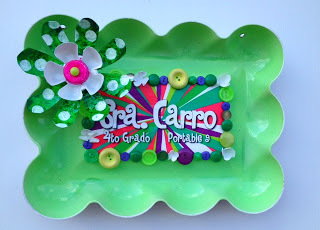 I love how you repurposed so many things!! WOW! 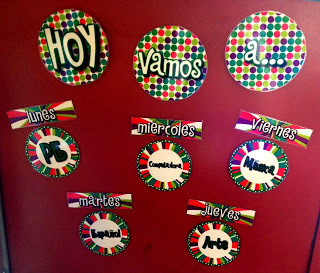 You are living my dream of teaching in a Spanish immersion classroom. I would love to learn in a beautiful, green environment like yours! Well, come on down to Lexingon, SC, where Spanish immersion teachers are hard to come by!! Thank you for your kind words! 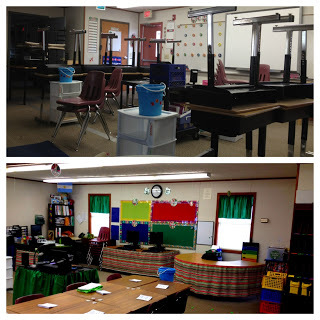 Love your classroom! What grade do you teach? Thanks, Lita! (Is that the name you go by?) 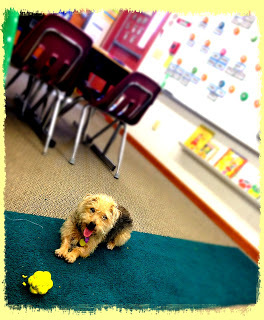 I teach fourth grade, which after six years in kinder I feel is the perfect age. For me anyway! What do you teach? I saw your clip art in the Tpt newsletter. Congrats! Love the "yo" phrases! Those are so tricky for my kids too! Thank you for the Mr. Potato Head freebie! I teach second and I know they will love it. Your room looks fabulous. Have a great year! I have been saving recycled bottles to put messages in that they write, or to use as bowling pins. Every year I use recycled shoe and kleenex boxes as dioramas. I love the Mr. Potato Head idea, and my students will as well. I am wondering if they couldn't make a minion out of recycled things? I wish you a wonderful year.